Our founding editor, Shawn Tribe, has just officially launched a new website, Liturgical Arts Journal. 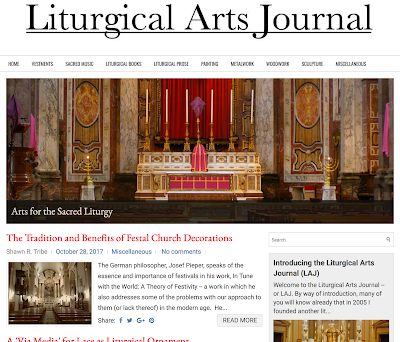 “It is with great pleasure that I announce to you today the launch of a new site dedicated exclusively to the liturgical and ecclesiastical arts: Liturgical Arts Journal (LAJ). As before with NLM, the approach and focus will be non-polemical, concentrating on the history of liturgical arts, and showcasing the very best contemporary work in the sphere of liturgical-ecclesiastical art and design: work characterized by the Benedictine principle of continuity, and development in continuity. The focus will primarily be on ‘what we are for’, rather than ‘what we are against.’ Where critique is offered, it will be constructive critique. Focus is not limited to one particular liturgical rite or use. Call for Content Submissions and Guest Articles: If you have stories, photos, news, etc. that you would like to submit for publication consideration now or in the future, please email them to me at stribe@liturgicalartsjournal.com, or send them via Facebook message on the LAJ Facebook page. If you are interested in contributing an article to LAJ, please send an abstract of your proposed submission at the same email or via the Facebook page. The site was officially launched today, but there are already a few backdated posts, including an introductory post on the scope and purpose of the site. We are very happy to congratulate Shawn on the beginning of his new project, and wish him every success! I expect there will be a good amount of collaboration between NLM and LAJ.